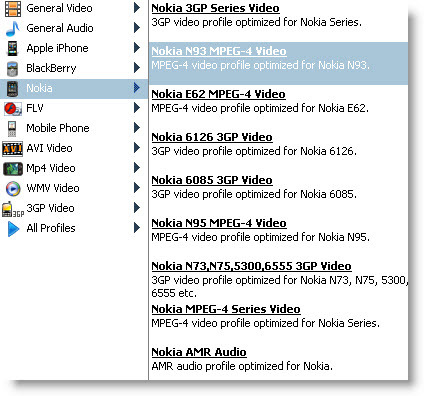 This is the step by step user guide that shows you how to rip DVD movies and TV shows to Nokia 3GP MP4 format, convert video files from various sources to Nokia 3GP MP4 format and download and convert YouTube videos to Nokia 3GP MP4 format so that you can watch DVD movies and TV shows, video files and YouTube video on your Nokia mobile phone. Insert the DVD disc into the disc drive, click the "Open DVD" button to import it if you are going to watch a DVD movie on your Nokia cell phone. Or if the DVD movie is saved as a folder on your computer, you need to click the "Add Video" button to locate that folder, which is composed of two separate folders: VIDEO_TS and AUDIO_TS. From the VIDEO_TS folder, select the .vob file to import and then click "OK". From the drop-down list of "Profile", navigate to the "Nokia" category. From the sub-category, you can choose the most appropriate output format. Note: From the profile graph above, we can learn Clone2Go DVD to Nokia Converter also applies to ripping DVD movies and converting video to video/audio formats for BlackBerry, iPhone, Mobile Phone, etc. Now you can click the "Start Encode" button to starting ripping DVD movies and converting videos for your Nokia phone. If you want to watch YouTube videos on your Nokia phone, you can click the "YouTube" button on the main interface. In the pop-up window, copy and paste the URLs of the YouTube videos one by one. Clone2Go DVD to Nokia Converter allows you to batch import DVD movies and video files and batch convert DVD movies and video files as well.